People sometimes ask me how I can model church growth, using mathematics, given that it is God who grows the church. I can answer that in two ways. Firstly we construct mathematical models of many things in the world, e.g. in physics or economics. All are open to a quantitative understanding, nevertheless are all are under God’s control and made by Him. We can model the motion of the planets, but it is God who is moving them. He is just doing it in a way we can understand – sometimes. Church growth is no different, except we understand even less! However, and more importantly, a model is only an attempt to understand reality. It makes assumptions that make reality easier to understand. But the model is not the reality. The two are very different. We construct the model, but God constructs and controls the reality! I must admit this was not the blog I intended to write. However the events of the Cwmbran Outpouring are daily turning my thinking on its head. As soon as I have one idea, another replaces it. Reality has overtaken the model! After my latest visit to Victory church something really profound struck me. Not only is there a powerful presence of God at the meetings, it is even more powerful in the days following. The presence of Jesus persists. It is almost impossible to do anything without thinking about Him, praying and worshipping. As if one want to do anything without Him anyway! His “presence” persists and persists. This is the hallmark of an authentic move of God and, as I will try and explain, the hallmark of revival. To explain how the persistence of God’s presence is connected to revival and church growth I am going to use a model. So this blog is not about my experiences at Victory Church this time, but it comes out of my experience. There are now many accounts of the outpouring on the Internet so if you are unfamiliar with this outpouring please chase up the links . So what I wish to show is than when the presence of God persists church growth is rapid and reaches high levels. The R is for reinforcing as it accelerates growth. The B is for balancing as it opposes growth. The key to church growth is for enthusiasts to reproduce themselves faster than they are lost. The Biblical name for revival is an “Outpouring of the Spirit”. The revival historian J. Edwin Orr, made the case that when man cooperates with such outpourings, rapid church growth follows . This is “revival growth”. Revival is the spiritual work of God in man, the manifestation of His presence in the soul; church growth is the result. Now I must be clear here, we do not seek the presence of God to obtain church growth, we seek Him because of who He is. The church growth is the result, a wonderful result all the same. It is a double blessing: we enjoy Jesus at a personal level, and we see people saved as the church grows. You can have church growth without revival. Principles can be applied that enhance growth, just like any organisation. This is OK as far as it goes, but when you have principles without the presence, you have a kingdom without a King . You can have revival without church growth. But God revives his people not just to bless them, but also to save the world. So the intention is that church growth results from revival. Revival growth is remarkably rapid as enthusiasts reproduce themselves far more effectively than in “normal” times. They also make enthusiasts out of existing believers, even old-timers, and they are very effective in conversion, all the work of the Holy Spirit of course, in believer and unbeliever alike. What I want to show is that the more the presence of God persists in the believer, and His church, the more the church grows. When the presence comes upon us it manifests itself in our spiritual lives. Not only is our experience of Him heightened, but we pray more, read the Bible and practice it more, we witness more, we talk about Him more. Our whole life is affected and we can’t get enough of the things of God. Anyone who has been at the Cwmbran Outpouring can testify to this. But this affects the spiritual life of a church. 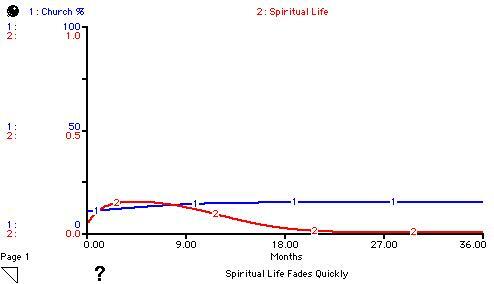 Its spiritual temperature goes up. 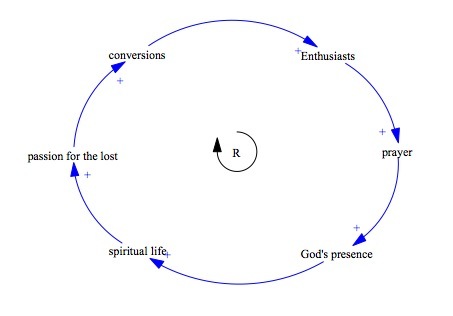 In this there is another feedback loop: the more enthusiasts, the more who gather, pray and seek God’s presence, the more his presence  the more spiritual life in the people, the more life, the more passion for the lost and thus the more effective they are in conversion giving even more enthusiasts. The church and its people get spiritually hotter and hotter. Pray -> presence -> life -> passion. At the end of the day, Passion for the lost is the only key to church growth . 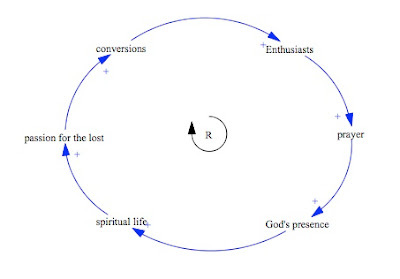 When the presence of God persists ….. the passion for the lost persists and sees conversions. 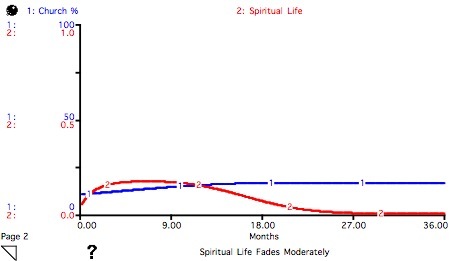 The effectiveness of this additional feedback loop depends on how much the spiritual life persists in the enthusiasts, and that depends on how much His wonderful presence persists in us. It is this persistence of Gods presence that I have noticed about Cwmbran, it persists long after the day of the meeting has gone. And when the presence of God persists …. ? 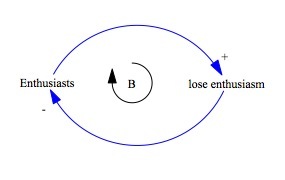 A research student of mine built this new feedback loop into the limited enthusiasm church growth model, and the results are remarkable . 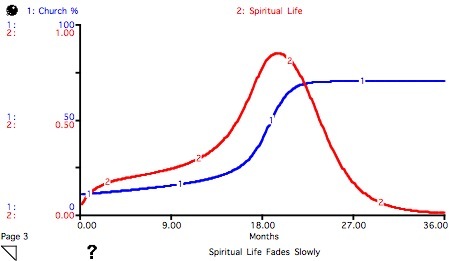 The limit to the church’s growth depends on a number of factors but one is how long the spiritual life in a believer persists at a high level. The longer the life persists the more the growth. When the presence of God persists ….. church growth is dramatic. The bulk of the community has been converted and the average spiritual life in the enthusiasts has shot through the roof about 18 months in. When the presence of God persists there is rapid growth and a church that is absolutely on fire. A dramatic tipping point  has occurred! 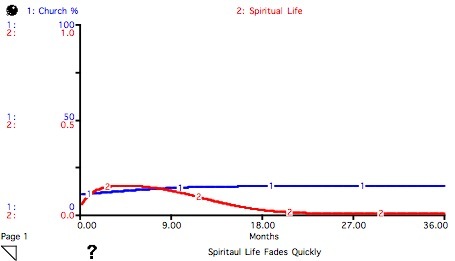 Why does the spiritual life always disappear? Answer: Because over longer time periods we would need births and migration (left out of the model). 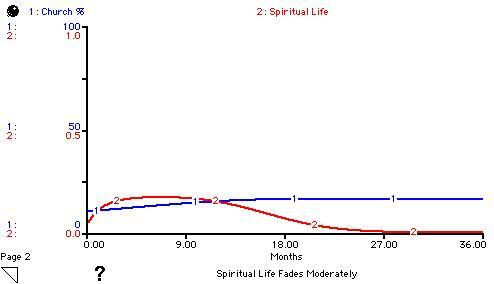 In practice there is always some level of spiritual life, and in rapid revivals the peaks in that life end up coming in bursts. Remember activity has not ceased, just the work of God in the soul that drives people into mission. People may be doing many things, they may even feel spiritual, but it is not channelled into conversion, a passion for the lost  and making new enthusiasts. Why should the presence of God fade in us? Answer: That is the human condition. We may spend time seeking the presence of God, have a wonderful experience and think “that is it”, and move on! Instead we should go on seeking His presence: One thing I ask, this is what I seek, that I may dwell in the house of the Lord all the days of my life, to gaze upon his beauty, Psalm 27. So do not criticise people who keep going back to centres of outpourings, like that at Cwmbran at present, this is essential for spiritual health. 70% of the community in church seems massive. Answer: The trouble here is the scope of the word “community”. For many churches their community is much less than the size of their own town or neighbourhood. It is God’s responsibility to pour out of His Spirit. It is our responsible to make sure we contact as many people as possible so they may also share in what He is doing – i.e. expand our community of influence. When the presence of God persists …. we have revival, enthusiasts, conversions and church growth. The presence of God persists in us when He, in his mercy, shows his favour towards us. Dare we believe that he is showing his favour to Wales again? It is so easy to be cynical and say “no its not revival, just another set of meetings and hype”. And believe me the there are number of “Jonahs” saying this on the Internet. But ask yourself, what do you want? Do you want His presence? Do you want it to persist? Do you want a deep spiritual life in Christ? Do you want a church on fire? Do you want to see people saved – conversions? Then get to an outpouring meeting, whether Cwmbran, or elsewhere, and let Him make you the enthusiast that He needs for His revival. P.S. A bit of a more technical post than usual. If there are things you did not follow, post up your questions and I will answer the best I can. Martyn Lloyd-Jones , Joy Unspeakable, chapter 3, “I would define a revival as a large number, a group of people, being baptised by the Holy Spirit at the same time”. Kingsway Publications. “A community saturated by God” was Duncan Campbell’s favourite description of revival. Quoted from Brian Edwards, Revival, chapter 1, Evangelical Press. The song “Just One Touch from the King” by Godfrey Birtill has been the anthem of the Cwmbran Outpouring. Tweet by David Pike (@daipike). “If we are being revived, then it is revival.” 9/6/13. J. Edwin Orr, The Outpouring of the Spirit in Revival and Awakening and its Issue in Church Growth, British Church Growth Association, available at Church Growth Modelling, by permission. Tweet by MrClydeT (‏@MrClydeT) (a pastor at Victory Church Cwmbran. “When you have principles without the presence, you have a kingdom without a king!” 9/6/13. Fear not we do not attempt to model the presence of God! We take the link directly from enthusiasts to spiritual life. How could one measure his presence? Having said that a former student of mine has been at the meetings 2-3 days a week since the start. When I asked her what was different about these meetings, she said they were taking the presence of God to a whole new level. So there is a sense it can be “measured” not by numbers but by comparison to past experiences. In mathematics this is called a bifurcation (See Blog by Tom Fiddaman). The next comments are for mathematicians only! Epidemic models are rich with bifurcations. Most have a forward (transcritical) bifurcation between the disease-free state and endemic state. In church growth terms it means that for different parameter values churches either survive or go extinct. It does not sound so profound when put that way! However once other elements are added the models also exhibit backward bifurcation where more than one stable endemic state can exist (subcritical) and the high states can suddenly disappear or appear (supercritical). This is a feature of the way people interact in groups, common in many epidemic models. 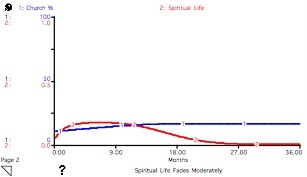 It is a phenomenon similar to this that happens in the church growth model with spiritual life, a small change in the persistence of that life in the believers and a high value of church “appears” and rapid growth results towards it. 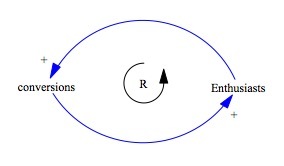 In system dynamics terms an extra reinforcing loop kicks in that accelerates growth. In spiritual terms the presence of God is deep, amazing and persists. Heaven on Earth!